Calgary Flames general manager Jay Feaster got his man -- without having to worry about losing him to another team in free agency. With his team in need of more offense from the blue line, Feaster in Wednesday acquired the rights to impending defenseman Dennis Wideman from the Washington Capitals -- then signed him to a five-year contract worth $26.25 million. The deal has an average annual value of $5.25 million. It's a deal Feaster had been working to complete at the NHL Draft in Pittsburgh after the Flames identified Wideman, a 29-year-old defenseman, as one of their prime targets in free agency -- Wideman would have become an unrestricted free agent on July 1. "We had Dennis Wideman right up there on top of the list," Feaster said. "We made the decision [to see] if we could get the opportunity to talk to him ahead of time. We contacted Washington; [GM] George McPhee said 'if you get a deal done, it's a fifth-round pick. "We tried to get a deal done right through Round 5 of the draft on Saturday. Afterwards, I went back to George and said 'I think we're close. If we get a deal done next week, we'll still flip the fifth. Are you still willing to do it?' He said he was, we continued the negotiating process and we were able to get a contract signed this morning." The Flames gave up 26-year-old minor-league defenseman Jordan Henry and their fifth-round pick in next year's NHL Draft in exchange for the exclusive right to negotiate with Wideman before free agency. "For us, it was getting a guy that we had targeted and getting him ahead of free agency on July 1, when there are going to be a lot of teams going after the same players," Feaster said. "To get the head start -- we felt it was important. We're glad to have him aboard." The veteran defenseman was an All-Star with the Capitals this past season and finished with 11 goals and 35 assists in 82 games. However, he had only three assists in 14 playoff games and received a season-low 15:16 of ice time in the Caps' final game of the season, Game 7 of the Eastern Conference Semifinals against the New York Rangers. Feaster said he didn't waste any time making his pitch to Wideman. "We were very up-front right away with a good offer," he said. "The other thing we did, as we've done in the past, we spoke with [captain] Jarome [Iginla] and asked if he would give [Wideman] a call. He did, and Jarome sold him on why this is a great place with a great ownership and a great fan base -- the building is full every night and hockey matters." "To get it done in the space of a week, with the draft sandwiched in the middle of it -- that's not bad from a timing perspective. We've got a guy who's excited to be here." Wideman has 67 goals and 184 assists for 251 points in 535 career games played with St. Louis, Boston, Florida and Washington. He has averaged just over 40 points during the past five seasons. Wideman also led Washington defensemen with 113 hits and was fourth on the team with 132 blocked shots. He gives the Flames a solid top four along with Mark Giordano, Jay Bouwmeester and Chris Butler. "He's a guy who can play the point on the power play. 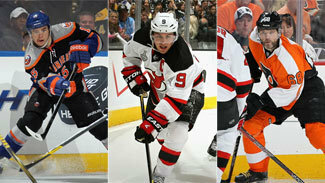 He's not afraid to shoot the puck," Feaster said. "He makes a good first pass. He'll help in terms of our transition game. We think with the up-tempo style that [new coach] Bob [Hartley] wants to play that he can be up the ice, he can be involved in the offense and still do a good job in the neutral zone. "I think the fans will see us playing a different style of hockey, and I think Dennis will fit into that nicely. If you look at it from the standpoint of our starting four, to have Giordano, Wideman, Bouwmeester and Chris Butler -- that's a pretty decent starting four." Feaster also brought back forward Blake Comeau, who signed a one-year deal worth $1.25 million -- about half of what he made in 2011-12. Calgary grabbed Comeau on waivers from the New York Islanders, who let him go after he went scoreless in 16 games on Long Island. Comeau scored five goals and added 10 assists in 58 games with the Flames. Calgary didn't make Comeau a qualifying offer, allowing him to become a free agent, but Feaster said that didn't mean the Flames weren't interested in having him back. "It's good to have him back," he said. "We even talked about a two-year deal, but what I liked was that he said, 'let's do a one-year deal, because I'm better than what I showed you guys and I'm going to have a big season."